If this turns out to be Mark Gatiss' final script for Doctor Who, then he's going out on a massive high as we absolutely loved and adored Empress Of Mars! There are so many classic series elements here that tick all the right boxes, and we don't just mean the Ice Warriors. The majority of the adventure is set in the caves underneath Mars, and thanks to the truly awesome locations used, the look and overall feel instantly pulls you in. There are elements of those cave scenes in Earthshock, but owing to the colour palette everything feels so much more other-worldly. This feels straight out of the classic series, but with all the trimmings of the new series and its budget. In a nutshell, the year is 1881 and The Doctor, Bill and Nardole arrive on Mars to find Victorian soldiers from Earth in the subterranean cave network. Among them is a lone Ice Warrior who serves tea and even tidies up afterwards! It's not long before the army discover a long-lost tomb, but with dissension in the ranks, chaos is just around the corner. As promised by Gatiss, we are introduced to a new type of Ice Warrior, and how wonderful she is! Iraxxa not only adds a new vein to the Ice Warriors mythos, but she proves a powerful force to be reckoned with, whilst throwing a good old punch in the air for girl power. Bill bookends the girl power, thanks to her negotiation skills with Iraxxa; in fact women seem to rank higher than men in Ice Warrior culture. Whilst historically The Ice Warriors have generally been considered a Doctor Who villain, we like how Gatiss has fleshed them out (quite literally in Cold War) and made them so much more than a slick, green, waddling "upright crocodile", and given them some redeeming qualities (beach ball kills, aside). In fact, in Empress Of Mars, we actually see an Ice Warrior run! If there is just one gripe we have, it's the way in which the Ice Warrior's kill their victims. Gone are the days of the inverted, shaky mirror death, now they're turned into...well...human beach balls. That being said, I certainly wouldn't want to be turned into a human beach ball, so the threat element remains intact...in a roundabout way. This is a relatively Nardole-light episode, with the main pocket of his scenes at the start, but when he does eventually turn up again, it sets the scene for a rather complex situation that The Doctor will have to resolve at the start of The Eaters Of Light. Empress Of Mars is a textbook Doctor Who adventure that does a lot more than it seems at first glance. As well as being a rollicking good monster story, it actually incorporates many aspects of the show that has lead to its success over the years. There's time travel, rich characters, genuinely scary monsters, and, more importantly, a stonkingly good script. We really hope this isn't Mark Gatiss' final script for Doctor Who! This is probably our favourite episode of Series 10 so far! 2) A nod to an actress last seen in Series 2. 5) "This can't happen. This...is not what we agreed to." 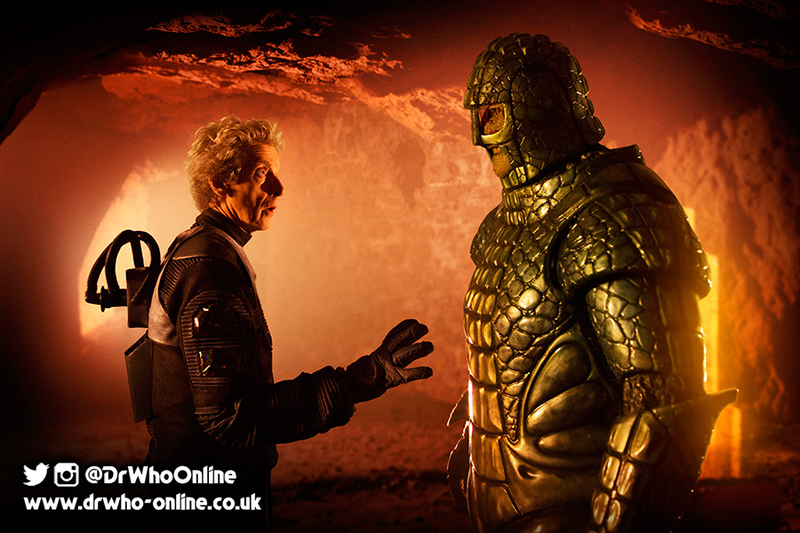 + 10.9: Empress Of Mars airs This Saturday at 7:15pm on BBC One.